Let me just start off by saying how excited I am about this show. Not only does it star Tony winners Audra McDonald, Brian Stokes Mitchell, and Billy Porter, but it is being directed by George C. Wolfe, and choreographed by Savion Glover. That is a lot of big time talent my friends. So now that you know who's in the show I'm guessing you probably are wondering how you can get tickets to see it right? Well do I have great news for you. We sell it. In fact we sell tickets to every new show set to open this season. Oh and just in case you are wondering there are twenty-six shows scheduled to open between now and next April. Now only three of those shows are new musicals. I guess Hamilton scared everybody away huh? But enough about those other shows. You came here to find out how to get ticket's to see Shuffle Along. Like I said tickets are now on sale. Not only that, but the Music Box is one of the smallest theatre's on Broadway. How many theatre's can you say that about? Actually you can say that about most of them. Previews are set to begin on March 14, 2016 with opening night scheduled for April 21. 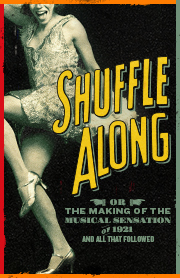 Get your tickets to see Shuffle Along on Broadway at the Music Box Theatre. I can't wait.